Upgrade your home with our beautiful indoor and outdoor lighting installation services. Recessed lighting is one of the most versatile illumination options available for Phoenix homes because they are sleek and easy to maintain. Recessed lighting, which is also known as can or pot lighting, comes in many styles, colors, and sizes. Today, you can even get LED recessed lighting for a brighter home with more efficiency than incandescent or fluorescent bulbs. 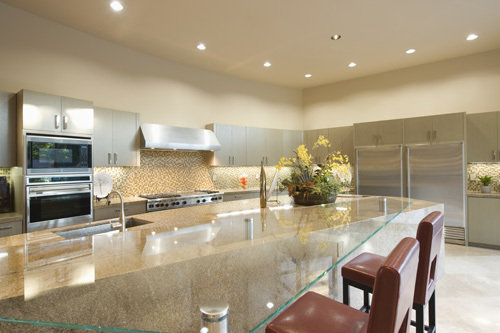 Homeowners love to modernize their spaces with recessed lighting in kitchens, dining rooms, living rooms, and bedrooms. Our experts are able to replace dated light fixtures with sophisticated lighting solutions that highlight your home's beauty and provide ample lighting. We also can install track lighting for a different effect in your home. Other illumination options we provide for local residents include outdoor spaces. Our landscape lighting installations include spotlights, stringed Edison lights, and rope lighting. We do it all! We work with all types of patios and yard spaces to help you illuminate steps, entry points, and garden highlights. You can even ask our experts for color filters to give your home a more dramatic look in the evening. 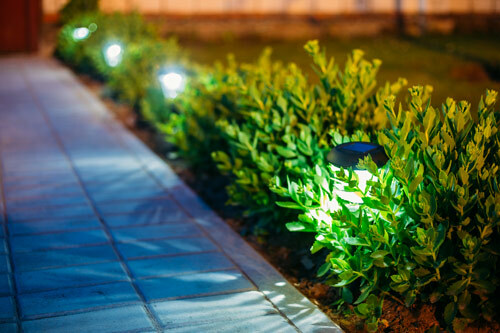 We recommend choosing a yellow tinted bulb or a color filter for landscape lighting in the Phoenix area. Yellow tints serve as a great pest deterrent without sacrificing your landscape design or visibility. The Mighty Electricians are local experts licensed for electrical repairs and installations. Since we started in 1999, we have helped many throughout Phoenix, AZ with indoor and outdoor lighting upgrades. Get started on your next home lighting project when you schedule a consultation with our team today! We stand by our upfront pricing estimates designed to save you money, and we always provide dust-free service.